A dictionary, sometimes known as a wordbook, is a collection of words in one or more specific languages, often arranged alphabetically (or by radical and stroke for ideographic languages), which may include information on definitions, usage, etymologies, pronunciations, translation, etc. or a book of words in one language with their equivalents in another, sometimes known as a lexicon. It is a lexicographical reference that shows inter-relationships among the data. The oldest known dictionaries were Akkadian Empire cuneiform tablets with bilingual Sumerian–Akkadian wordlists, discovered in Ebla (modern Syria) and dated roughly 2300 BCE. The early 2nd millennium BCE Urra=hubullu glossary is the canonical Babylonian version of such bilingual Sumerian wordlists. A Chinese dictionary, the c. 3rd century BCE Erya, was the earliest surviving monolingual dictionary; although some sources cite the c. 800 BCE Shizhoupian as a "dictionary", modern scholarship considers it a calligraphic compendium of Chinese characters from Zhou dynasty bronzes. Philitas of Cos (fl. 4th century BCE) wrote a pioneering vocabulary Disorderly Words (Ἄτακτοι γλῶσσαι, Átaktoi glôssai) which explained the meanings of rare Homeric and other literary words, words from local dialects, and technical terms. Apollonius the Sophist (fl. 1st century CE) wrote the oldest surviving Homeric lexicon. The first Sanskrit dictionary, the Amarakośa, was written by Amara Sinha c. 4th century CE. Written in verse, it listed around 10,000 words. According to the Nihon Shoki, the first Japanese dictionary was the long-lost 682 CE Niina glossary of Chinese characters. The oldest existing Japanese dictionary, the c. 835 CE Tenrei Banshō Meigi, was also a glossary of written Chinese. In Frahang-i Pahlavig, Aramaic heterograms are listed together with their translation in Middle Persian language and phonetic transcription in Pazand alphabet. A 9th-century CE Irish dictionary, Sanas Cormaic, contained etymologies and explanations of over 1,400 Irish words. In India around 1320, Amir Khusro compiled the Khaliq-e-bari which mainly dealt with Hindustani and Persian words. In medieval Europe, glossaries with equivalents for Latin words in vernacular or simpler Latin were in use (e.g. the Leiden Glossary). The Catholicon (1287) by Johannes Balbus, a large grammatical work with an alphabetical lexicon, was widely adopted. It served as the basis for several bilingual dictionaries and was one of the earliest books (in 1460) to be printed. In 1502 Ambrogio Calepino's Dictionarium was published, originally a monolingual Latin dictionary, which over the course of the 16th century was enlarged to become a multilingual glossary. In 1532 Robert Estienne published the Thesaurus linguae latinae and in 1572 his son Henri Estienne published the Thesaurus linguae graecae, which served up to the 19th century as the basis of Greek lexicography. The first monolingual dictionary written in Europe was the Spanish, written by Sebastián Covarrubias' Tesoro de la lengua castellana o española, published in 1611 in Madrid, Spain. 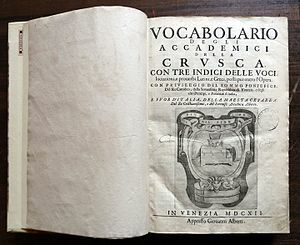 In 1612 the first edition of the Vocabolario degli Accademici della Crusca, for Italian, was published. It served as the model for similar works in French and English. In 1690 in Rotterdam was published, posthumously, the Dictionnaire Universel by Antoine Furetière for French. In 1694 appeared the first edition of the Dictionnaire de l'Académie française. Between 1712 and 1721 was published the Vocabulario portughez e latino written by Raphael Bluteau. The Real Academia Española published the first edition of the Diccionario de la lengua española in 1780, but their Diccionario de Autoridades, which included quotes taken from literary works, was published in 1726. The Totius Latinitatis lexicon by Egidio Forcellini was firstly published in 1777; it has formed the basis of all similar works that have since been published. The first edition of A Greek-English Lexicon by Henry George Liddell and Robert Scott appeared in 1843; this work remained the basic dictionary of Greek until the end of the 20th century. And in 1858 was published the first volume of the Deutsches Wörterbuch by the Brothers Grimm; the work was completed in 1961. Between 1861 and 1874 was published the Dizionario della lingua italiana by Niccolò Tommaseo. Between 1862 and 1874 was published the six volumes of A magyar nyelv szótára (Dictionary of Hungarian Language) by Gergely Czuczor and János Fogarasi. Émile Littré published the Dictionnaire de la langue française between 1863 and 1872. In the same year 1863 appeared the first volume of the Woordenboek der Nederlandsche Taal which was completed in 1998. Also in 1863 Vladimir Ivanovich Dahl published the Explanatory Dictionary of the Living Great Russian Language. The Duden dictionary dates back to 1880, and is currently the prescriptive source for the spelling of German. The decision to start work on the Svenska Akademiens ordbok was taken in 1787. In 1616, John Bullokar described the history of the dictionary with his "English Expositor". Glossographia by Thomas Blount, published in 1656, contains more than 10,000 words along with their etymologies or histories. Edward Phillips wrote another dictionary in 1658, entitled "The New World of English Words: Or a General Dictionary" which boldly plagiarized Blount's work, and the two denounced[clarification needed] each other. This created more interest in the dictionaries. John Wilkins' 1668 essay on philosophical language contains a list of 11,500 words with careful distinctions, compiled by William Lloyd. Elisha Coles published his "English Dictionary" in 1676. According to the Manual of Specialized Lexicographies, a specialized dictionary, also referred to as a technical dictionary, is a dictionary that focuses upon a specific subject field. Following the description in The Bilingual LSP Dictionary, lexicographers categorize specialized dictionaries into three types: A multi-field dictionary broadly covers several subject fields (e.g. a business dictionary), a single-field dictionary narrowly covers one particular subject field (e.g. law), and a sub-field dictionary covers a more specialized field (e.g. constitutional law). For example, the 23-language Inter-Active Terminology for Europe is a multi-field dictionary, the American National Biography is a single-field, and the African American National Biography Project is a sub-field dictionary. In terms of the coverage distinction between "minimizing dictionaries" and "maximizing dictionaries", multi-field dictionaries tend to minimize coverage across subject fields (for instance, Oxford Dictionary of World Religions and Yadgar Dictionary of Computer and Internet Terms) whereas single-field and sub-field dictionaries tend to maximize coverage within a limited subject field (The Oxford Dictionary of English Etymology). Another variant is the glossary, an alphabetical list of defined terms in a specialized field, such as medicine (medical dictionary). Large 20th-century dictionaries such as the Oxford English Dictionary (OED) and Webster's Third are descriptive, and attempt to describe the actual use of words. Most dictionaries of English now apply the descriptive method to a word's definition, and then, outside of the definition itself, and information alerting readers to attitudes which may influence their choices on words often considered vulgar, offensive, erroneous, or easily confused. Merriam-Webster is subtle, only adding italicized notations such as, sometimes offensive or stand (nonstandard). American Heritage goes further, discussing issues separately in numerous "usage notes." Encarta provides similar notes, but is more prescriptive, offering warnings and admonitions against the use of certain words considered by many to be offensive or illiterate, such as, "an offensive term for..." or "a taboo term meaning...". A historical dictionary is a specific kind of descriptive dictionary which describes the development of words and senses over time, usually using citations to original source material to support its conclusions. In many languages, such as the English language, the pronunciation of some words is not consistently apparent from their spelling. 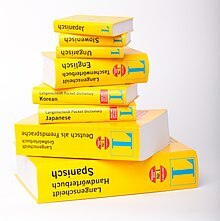 In these languages, dictionaries usually provide the pronunciation. For example, the definition for the word dictionary might be followed by the International Phonetic Alphabet spelling /ˈdɪkʃənɛri/. American English dictionaries often use their own pronunciation respelling systems with diacritics, for example dictionary is respelled as "dĭk′shə-nĕr′ē" in the American Heritage Dictionary. The IPA is more commonly used within the British Commonwealth countries. Yet others use their own pronunciation respelling systems without diacritics: for example, dictionary may be respelled as DIK-shə-nerr-ee. Some online or electronic dictionaries provide audio recordings of words being spoken. The age of the Internet brought online dictionaries to the desktop and, more recently, to the smart phone. David Skinner in 2013 noted that "Among the top ten lookups on Merriam-Webster Online at this moment are 'holistic, pragmatic, caveat, esoteric' and 'bourgeois.' Teaching users about words they don’t already know has been, historically, an aim of lexicography, and modern dictionaries do this well." ^ Nielsen, Sandro (2008). "The Effect of Lexicographical Information Costs on Dictionary Naming and Use". Lexikos. 18: 170–189. ISSN 1684-4904. ^ R. R. K. Hartmann (2003). Lexicography: Dictionaries, compilers, critics, and users. Routledge. p. 21. ISBN 978-0-415-25366-6. ^ a b Dictionary – MSN Encarta. Archived from the original on 2009-10-31. ^ Peter Bing (2003). "The unruly tongue: Philitas of Cos as scholar and poet". Classical Philology. 98 (4): 330–348. doi:10.1086/422370. ^ Rashid, Omar. "Chasing Khusro". The Hindu. Retrieved 5 August 2012. ^ Tesoro de la lengua castellana o española, edición integral e ilustrada de Ignacio Arellano y Rafael Zafra, Madrid, Iberoamericana-Vervuert, 2006, pg. XLIX. ^ "OSA – Om svar anhålles". g3.spraakdata.gu.se. Retrieved 13 October 2017. ^ "1582 - Mulcaster's Elementarie". www.bl.uk. Retrieved 13 October 2017. ^ A Brief History of English Lexicography Archived 2008-03-09 at the Wayback Machine, Peter Erdmann and See-Young Cho, Technische Universität Berlin, 1999. ^ John P. Considine (27 March 2008). Dictionaries in Early Modern Europe: Lexicography and the Making of Heritage. Cambridge University Press. p. 298. ISBN 978-0-521-88674-1. Retrieved 16 May 2016. ^ a b "Lynch, "How Johnson's Dictionary Became the First Dictionary"". andromeda.rutgers.edu. Retrieved 13 October 2017. ^ Simon Winchester, The Surgeon of Crowthorne. ^ Times, The Sindh (24 February 2015). "The first English to Einglish and Sindhi Dictionary of Computer and Internet Terms published - The Sindh Times". Archived from the original on 11 October 2017. Retrieved 13 October 2017. ^ Phil Benson (2002). Ethnocentrism and the English Dictionary. Taylor & Francis. pp. 8–11. ^ Ingrid Tieken-Boon van Ostade; Wim van der Wurff (2009). Current Issues in Late Modern English. Peter Lang. pp. 41–42. ^ Zuckermann, Ghil'ad (1999). Review of the Oxford English-Hebrew Dictionary, International Journal of Lexicography 12.4, pp. 325-346. ^ "dictionary". The American Heritage Dictionary of the English Language (5th ed.). Boston: Houghton Mifflin Harcourt. 2014. ^ David Skinner, The Role of a Dictionary in "Opinionator: Exclusive Online Commentary from the Times", The New York Times, May 17, 2013. "Dictionary" . Collier's New Encyclopedia. 1921. "Dictionary" . Encyclopædia Britannica (11th ed.). 1911. "Dictionary" . New International Encyclopedia. 1905.